Austin Shelton, a member of Allen-Lee Memorial United Methodist Church, has been named the Group Commander of the U.S. Air Force Junior Reserve Officer Training Corps (JROTC) at Newnan High School for the 2018-2019 school term. Austin has been an active participant in the Newnan High JROTC program since his freshman year. His leadership and dedication to the program were factors in his selection for this position. In recognition of his achievement, the congregation of Allen-Lee has named Austin as its seventh recipient of Allen-Lee Honors. Col. Arthur Davenport, who leads the NHS JROTC program, spoke during the presentation, characterizing Austin as a true cowboy, the kind of cowboy he as a child had always hoped to meet. In addition to JROTC, Austin is also active with 4-H, showing horses, and competing in rodeos. Austin's strength of mind, body, and spirit exemplifies the qualities the JROTC program seeks to instill in students. Presenting the certificate on behalf of the church was Rev. Michael McFarlin, pastor. 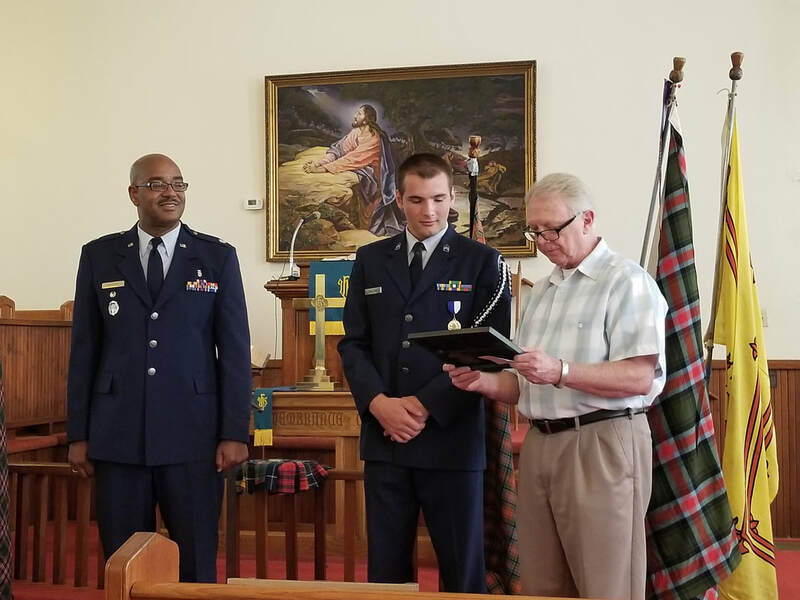 Winston Skinner, left, received a certificate for recognition as the sixth recipient of the Allen-Lee Honors award during the service on Sunday, July 22, 2018. Presenting the certificate on behalf of the congregation is Rev. Michael McFarlin, shown at right. Winston Skinner recently received the Otis A. Brumby Award for serious column writing in Division C of the Georgia Press Association’s 2018 Better Newspaper Contest. Winston has worked at The Newnan Times-Herald for more than 35 years, and he currently serves as the paper's editor. In presenting the Allen-Lee Honors certificate, pastor Rev. Michael McFarlin highlighted the career of Otis Brumby for whom the Georgia Press Association Award Winston received is named. As long-time publisher of The Marietta Daily Journal, Brumby kept the community informed about actions of local government, was influential in getting "sunshine" legislation passed to promote transparency in the functioning of government, and was a staunch defender of the First Amendment. Pastor Michael pointed out the similarities shared by Skinner and Brumby, noting the focus Skinner has on serving the community and keeping it informed. Davis Ozier became the fifth Allen-Lee Honors recipient on Sunday, October 15, 2017. Davis received this recognition for thru-hiking the Appalachian Trail. Although thousands attempt a thru-hike each year, only about one in four makes it all the way. A thru-hike of the Appalachian Trail requires a strong body and a strong mind. Davis began hiking the trail on March 18, 2017, at Georgia's Springer Mountain, the southernmost point of the trail. He was able to complete the trail in 120 days, reaching Mount Katahdin in Maine on July 15, 2017. Davis is a December 2016 graduate of Southern Polytechnic College of Engineering and Engineering Technology at Kennesaw State University. Hiking the trail provided life lessons about patience, endurance, and determination. It provided him with breathtaking views and up close encounters with wild animals and the best of humanity. Davis attended the service on October 15, and he was accompanied by his grandparents Bill and Frances Lowery, his mother Julia Ozier, and his sister Lydia Ozier. Nancy Lee, left, was presented with an Allen-Lee Honors certificate by Rev. Michael McFarlin, center, after Lone Oak Mayor Brian Ferrell, right, read a proclamation from the town designating April 2nd as "Nancy Lee Day." Nancy Lee was recognized as the third Allen-Lee Honors recipient at a presentation at the opening of the worship service on April 2, 2017. Mayor Brian Ferrell read the proclamation from the Town of Lone Oak proclaiming the day as Nancy Lee Day in recognition of her many contributions to good things in Lone Oak and Meriwether County. Rev. Michael McFarlin presented Nancy with an Allen-Lee Honors certificate. NOW, therefore I, Brian Ferrell, mayor of the Town of Lone, do proclaim April 2 as Nancy Lee Day in Lone Oak and encourage all citizens to participate in this celebration including the 11 a.m. worship service at Allen-Lee Church and the covered dish fellowship meal to follow. 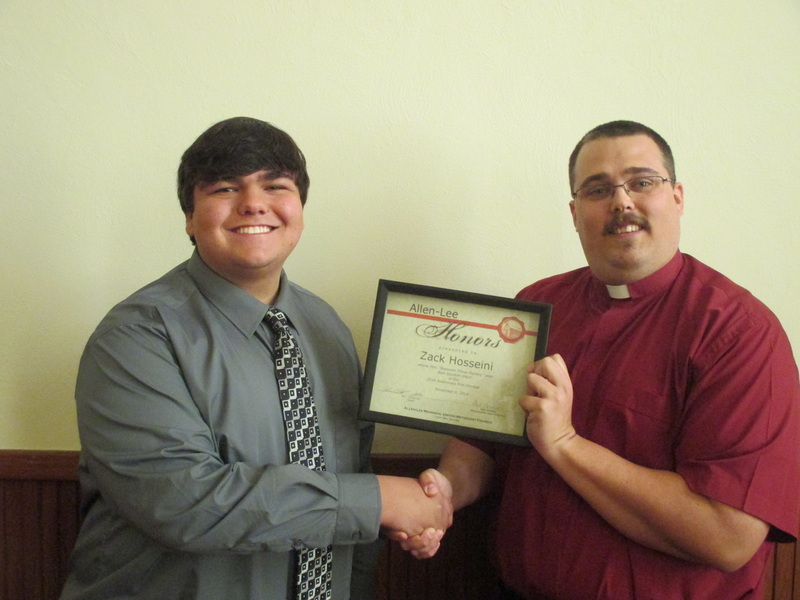 Brent Bohannon, left, was recognized as the third Allen-Lee Honors recipient at a presentation at the end of the worship service on July 31, 2016. Rev. Michael McFarlin, right, presented Brent with a certificate for his outstanding performance at a state livestock event earlier in the year. Ten-year-old Brent Bohannon from Moreland was recognized as the third recipient in the Allen-Lee Honors award on July 31, 2016. Brent won the Grand Champion Commercial Dairy Heifer Award at the 2016 Georgia Junior National Livestock Show held February 20 in Perry. Brent is a descendant of Rev. F.M.T. Brannon, pastor at Prospect Methodist Church in 1877. Prospect was renamed Allen-Lee Memorial United Methodist Church in 1939 with the completion of the current building. Rev. Michael McFarlin made the presentation of a framed "Allen-Lee Honors" certificate to Brent following the morning worship service. Marvin Bohannon, Brent's brother, was in attendance. Gregory Farmer, a teacher at Unity Elementary School, was recognized with the second Allen-Lee Honors award for his achievements and state-wide acknowledgement for innovative teaching practices. Greg, left, was presented a certificate from Rev. Michael McFarlin, pastor, on behalf of the members of Allen-Lee Memorial United Methodist Church. 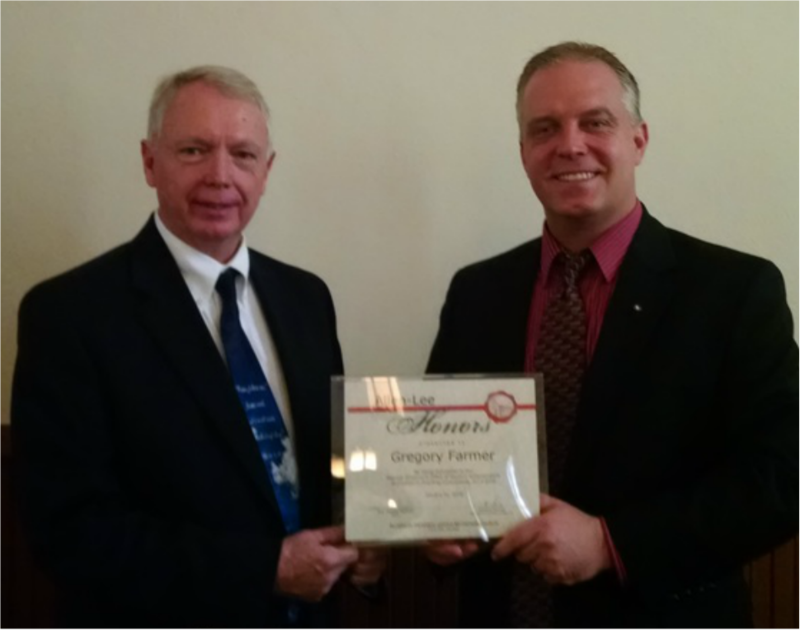 As a teacher at Unity Elementary School, Gregory Farmer has been recognized at the state-level for his innovative teaching practices. Allen-Lee Memorial United Methodist Church has partnered with Unity Elementary for several years, and the congregation used this opportunity to honor Greg for the recognitions he has received. During the worship service on January 31, 2016, Greg was presented with a framed "Allen-Lee Honors" certificate by Rev. Michael McFarlin, pastor. Many of Greg's family were in attendance. Zack Hosseini, grandson of Ed and Louise Nelson and son of Arani and Cricket Hosseini, was recognized for his achievements in film and video production and presented a certificate from Rev. Chad Hill, pastor, on behalf of the members of Allen-Lee Memorial United Methodist Church. Zack Hosseini, grandson of Ed and Louise Nelson, is a senior at Centennial High School. His film, “Between These Flames," won the award for Best Student Short at the Awareness Film Festival n the Third Street Promenade in Santa Monica, Calif. on Sept. 21. His film is a public service announcement encouraging teens not to drink and drive. He also won first place in the Georgia Skills USA digital cinema production for “Eviction Notice,” which placed sixth in national Skills USA competition earlier this year in Kansas City.